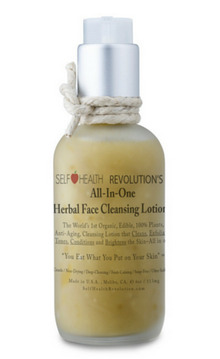 Our all-in-one Herbal Face Cleanser Lotion is an organic, edible, 100% plants, anti-oxidant cleansing formula. Our all-in-one Herbal Face Cleanser Lotion is an organic, edible, 100% plants, anti-oxidant cleansing formula that deeply cleanses your skin, removes any makeup and skin-aging debris, while also gently exfoliating and conditioning. This cleanser also leaves your skin instantly smoother and more radiant by working to unclog impurities and toxins deep within pores and deliver powerful plant anti-oxidants to treat signs of aging. Our cleanser is great for sensitive skin, oily skin, combination skin, mature skin, and even dry skin. This unique FACE serum is made from organic plant concentrates, antioxidants and enzymes, which are sourced from all over the world. 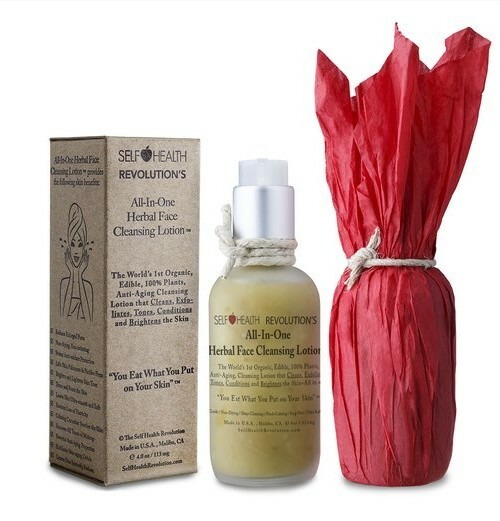 Herbal Face Cleanser is gentle enough to be used daily and around the eyes as it is soap-free. Helps improve tone, clarity, and texture. Specific plant nutrients and phyto-chemicals are added to provide firming benefits by improving facial muscle tone, enhancing contour, and diminishing the appearance of lines and wrinkles. Organic SUPER Herbal Face Food 2 oz.